Now in its third generation under BMW stewardship, the MINI is fast becoming a legitimate icon. It might be getting bigger every time, but it’s also getting better, to the extent that now it truly feels like a cut-size BMW. It’s also an award winner having scooped the Best Premium Small Car of the Year gong at our 2016 New Car Awards. And while it’s possible to spec a highly personalized MINI that’s eye wateringly expensive, regardless of engine, most versions are actually very well priced if you buy with restraint. Featuring some of the most frugal yet characterful engines in any small car, it’s both fun to drive and, largely, cheap to run. And thanks to the new five-door version, which retains the character of the three-door but adds more space, it’s now passable family transport, too – just. The MINI is a premium quality hatchback that stands out for its retro looks, in much the same way that the Fiat 500 and Volkswagen Beetle ape the style of iconic older generation models to woo buyers. 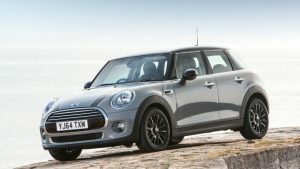 But while the MINI may appeal to the similarly style conscious, it’s not in the same segment as either the Fiat or VW. It competes for size against small hatchbacks like the Audi A1 and DS 3. While it may look the same as its predecessors, the MINI for sale today has grown ever larger. There’s extra cabin space and even the option of a five door model, while all versions get a little extra rear legroom and better boot space. If you want greater practicality, try the Clubman Estate version. Whichever you choose, the cabin is more upmarket than previously, and a new range of turbocharged engines adds refinement under the bonnet. As well as the three and five door models there’s also a MINI Convertible, and a bigger SUV/crossover called the MINI Countryman. The latest update of the MINI was introduced in the UK in 2014, but the range of trim levels remained essentially the same with MINI One, MINI Cooper and MINI John Cooper Works versions available. However, there’s also a new MINI Seven trim level which has its own distinctive look with silver highlights and some extra kit, while MINI dealers remain committed to up-selling specification – there are packs called Chilli and Pepper designed to tempt you to upgrade. Under the skin, the latest MINI uses the same engineering platform as it’s group sister-models, the BMW X1 and 2 Series Active Tourer. It also shares a series of petrol and diesel three-cylinder engines, which are smooth, efficient and a definite plus point across the MINI range as a whole. While the third generation car retains the original car’s retro looks, the exaggerated styling is beginning to look a little cartoon-like. The big, round headlights, gaping grille and overstyled rear can look awkward from some angles, especially in five-door form. Inside, the MINI gets a raft of technology with a fun side, and it’s safer, better equipped and more sophisticated than ever. Despite all this, the MINI can also be pretty affordable. Sure, it can get expensive if you go crazy with the bewildering amount of options available, but overall the MINI hatch is a cost-effective car to run. Its continuing desirability means residuals are excellent, and that’s despite the sheer number of MINIs on the road. Base prices are keen, although One models are pretty basic, but fuel and tax costs are also low. In fact the most economical model, the One D, has a list price that’s on a par with a Ford Fiesta ECOnetic. The range extends from an 83.1mpg, 89g/km diesel (the One D) to a 217bhp hot hatch (the John Cooper Works). The two extremes are separated by various compromises in-between – each excellent in its own way. MINI sporadically introduces themed special editions too, each bringing a certain look and additional kit. BMW has rung the ‘go-kart handling’ message dry since taking on the MINI brand in 2001, but it remains a very apt way to describe the driving experience. The latest MINI is one of the most all-out fun cars to drive at any price, with safe, predictable handling, near zero body roll and lots of feel through the seat and steering wheel. Combined with its low-slung driving position and near-enough perfect ergonomics, the MINI is usually a smile inducing experience. But that’s ‘usually’ because the ride quality can be firm to the point of being jarring, especially at lower speeds or on bad roads. The ride quality is noticeably better than that of previous generation MINIs, but the car doesn’t have the sophisticated balance of bump-soaking comfort and handling feel that, say, a Ford Fiesta has. It gets better or worse depending on wheel choice, so it’s up to you whether you want to choose the looks of 17- or 18-inch wheels from the options list, or the relative comfort of small-looking 15-inch wheels. Logically, 16-inch rims tend to be a nice compromise between the two. The sports suspension on Cooper S, SD and JCW stiffens and lowers the car noticeably, though optional adaptive dampers help because they let you toggle between a comfort and sports setting – pricey though they are. The MINI isn’t usually uncomfortable, however. It’s nicely settled at motorway speeds, while the relative lack of wind and road noise makes it feel like a very grown up small car. Factor in strong acceleration with most models (basic One variants aside), and this is a surprisingly relaxing long-distance cruiser. Of all the engines it’s the three-cylinder petrol Cooper that shines brightest, because it’s quick and very eager to be revved – but not so powerful that it races to unnecessary or unmanageable speeds. It really suits the character of the car, and it sounds great. All the engines are smooth as you like, but the Cooper D is especially impressive in that regard – frugal, punchy and amazingly quiet for three-cylinder diesel engine. The Cooper S and SD use four-cylinder engines for their additional pace. The longer five-door model feels no different to the three-door MINI from the front seat, with extra space between front and rear wheels having little discernable effect on handling – this is a car that cocoons the driver, in the positive sense. There are four petrol and three diesel engines to choose from. The entry-level MINI One gets a 101bhp 1.2-litre three-cylinder turbo, while the Cooper gets a 134bhp 1.5-litre three-cylinder. The Cooper S has a 2.0-litre four-cylinder engine with 189bhp, and the JCW model, also a 2.0-litre, is boosted further to 217bhp. The One D and Cooper D diesels are both 1.5-litre three-cylinder units that develop 94bhp and 115bhp respectively, while the Cooper SD gets a bigger 2.0-litre unit with 168bhp. Starting with the One, it’s really a petrol engine built for economy and needs to be worked hard to wring out any sort of performance. Its 9.9-second 0-62mph sprint is telling (10.1 in the five-door), but more so is its 180Nm peak torque – exactly half of what the Cooper SD has, for example. The 1.5-litre petrol in the Cooper really does shine, though. With 220Nm from just 1,250 it’s quite strong from low revs, but the real magic is at the top end of the rev range. It sounds raspy and pulls strongly, with 0-62mph coming in 7.9 seconds, or 8.2 in the five-door owing to its extra bulk. The Cooper S engine perhaps loses some charm on account of being a four-cylinder, but it’s very quick, with a 6.8/6.9-second sprint to 62mph (3dr/5dr) and a more fiery tone from the twin central exhaust pipes -and the Works 210 model gets an even racier soundtrack. And then the JCW engine, a highly tuned version of the Cooper S unit, is positively rip-roaring, racing up the rev range, popping and cracking all the way. Back down to earth, the diesels are more impressive in a day-to-day sort of way, with the One D and Cooper D engines incredibly smooth and quiet given they’re three-cylinder diesel units. However, the former is very sluggish and an engine bought for economy only, really. The Cooper D is much better, with much more in-gear punch, but set against the petrol Cooper there’s no doubt it’s distinctly lacking character, with its dearth of top-end punch. On the other hand, the Cooper SD feels positively rapid, with its 360Nm torque figure trumping even the JCW model – though it too runs out of steam at higher revs, when you really want your MINI to keep pressing on in-gear. 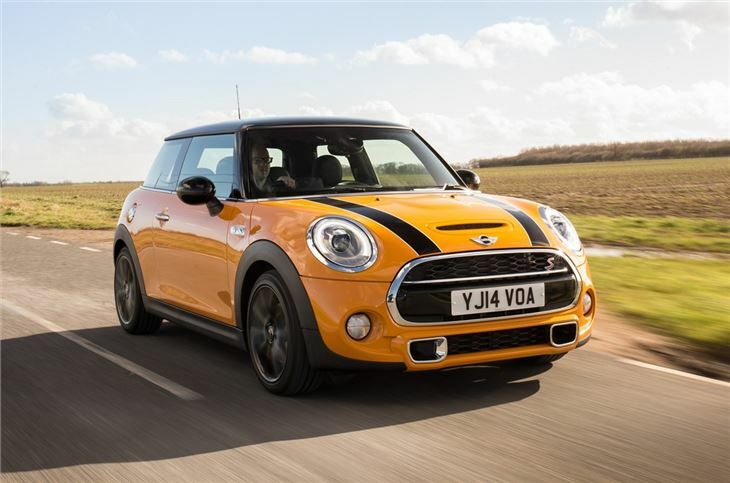 The MINI now comes with a choice of new six-speed manual or six-speed automatic gearboxes. The manual is more precise than the old one but isn’t quite as slick to shift, while the auto is more efficient but still never quite seems to know the right gear to be in. The MINI has always been quite fuel efficient, but this generation’s new range of engines improves things considerably. MINI claims the entry level 1.2-litre petrol found in the One is around 25 per cent more efficient than its predecessor – in the three-door it returns average fuel economy of 61.4mpg and CO2 emissions of 108g/km. However, given the extra performance on offer it’s remarkable that the larger 1.5-litre engine in the Cooper actually does better, posting 62.8mpg and 105g/km. That makes it a no-brainer, unless low initial purchase cost is essential. The three-cylinder Cooper engine uses the same TwinPower twin-scroll turbocharging and direct injection as BMW’s larger engines. The Cooper S is also impressive – its fuel economy is more than 5mpg better than the outgoing (second generation) model, at 49.6mpg, and CO2 falls to 133g/km from 149g/km. But it’s the diesels that are the real economy stars, although as usual the decision to buy one must factor in the circa-£1,000 additional cost over an equivalent petrol. The lower-power 1.5 found in the One D returns an amazing 83.1mpg average and emits 89g/km of CO2, while, arguably more impressively, the more powerful Cooper D version runs it very close, at 80.7mpg and 92g/km CO2. With the latter, the manual gearbox is the cleaner choice but the new automatic has a coasting function and stop-start, helping to improve day-to-day fuel use. Having a bigger, heavier five-door does dent fuel economy slightly, but only by one or two mpg, with CO2 figures increasing slightly across the board as well. Specify any MINI with the optional MINI Driving Modes – included in the popular Chili pack that most buyers choose with the Cooper – and you’ll be able to choose between Sport, Mid and Green settings. The system alters the parameters of the throttle, steering and air conditioning according to the mode selected. In Green mode it desensitises the accelerator pedal, makes the steering lighter and displays the most economical time to change gears. This helps save fuel. The MINI’s desirability and BMW servicing costs, mean it sits in higher insurance groupings than less ‘premium’ superminis like the Ford Fiesta. Starting in group 11 for a One (where the most basic Ford Fiesta is in Group 3), you’ll find a Cooper in group 18 and a Cooper S in 26, while the JCW will cost more to insure than a Volkswagen Golf GTI, in group 36. MINI itself offers fully comprehensive insurance – but don’t be fooled by a dealer into thinking it’s the only, or even the best, way to insure your MINI. One benefit of the MINI’s carefully cultivated premium image is that desirability remains very high relative to its ubiquity on UK roads. That means depreciation is excellent – good news for new buyers, though not so for those in the used market – so you can expect your MINI to have retained over half its value at three years/60,000 miles. It’ll be worth a bit more if you’ve chosen your specification and options wisely too, and if it’s a five-door – so be wary of brighter colours and of loading your car with additional kit and accessories, some of which will add no value. Chili pack, climate control, satellite navigation and fancier wheels are all options that add to a MINI’s appeal and value on the used market. Given the huge sales success of the first two generations of MINI, it’s no surprise that designers have played it safe with the latest car. In fact, at a glance it looks identical to the last one. But dedicated fans of the brand will notice the slightly more bulbous proportions and the larger front and rear lights. The five-door model gets rear side doors with frames, rather than the three-door’s frameless ones, plus an extra 72mm between the front and rear wheels, and 89mm more at the very back to boost the boot. It’s not as pretty as the three-door – and, frankly, looks a bit of a mess if you take in the details for too long – but somehow it still works as a whole. MINI has been bold as usual with the new car’s interior, and the eye-catching design still features plenty of retro touches. But there’s nothing retro about the driving position – as per the preceding two BMW-era MINIs, this one comes with a highly adjustable chair and steering wheel combo that ensures anyone can find a near perfect setup. Much of the switchgear has been relocated as compared to the outgoing model – the familiar line-up of toggle switches is still on the centre console, but the window buttons are now on the doors, while a BMW-style iDrive controller sits between the front seats, replacing the old car’s joystick. As with every MINI there’s huge scope for personalisation and myriad cost options, ensuring that you can at least feel like your MINI is unique – but it all soon adds up to one expensive MINI. The One comes with 15-inch wheels as standard but you can upgrade to alloys up to 18 inches, while fripperies like contrasting roof colours, mirror caps and various vinyl stripes and patterns can all be specified. Most owners opt for the Chili or slightly lesser Pepper pack, which both bundle together useful options like floor mats, bigger alloy wheels, passenger seat height adjustment, sports seats, air conditioning and Bluetooth. In the case of both packs, the price is less than the sum of the individual options. Dominating the dash is a large, circular display for the infotainment and optional sat-nav. In characteristic MINI style, its theatrical outer ring is illuminated and acts as an additional multi-colour display, mimicking various things including the speedometer, stereo volume, or flashing when the driver’s attention is required. It’s a neat trick in an otherwise uninspiring system, however. Based on BMW’s iDrive setup, the control panel comprising a touch-sensitive scroll wheel and buttons is both awkwardly placed between the front seats, and often counterintuitive – a touch screen would be a much better solution. The sound quality of the standard stereo is poor too. Ultimately it’s a clunky setup that’s especially disappointing in the context of the MINI’s overall ‘cooler younger driver’ sort of appeal. The new MINI is longer and wider than before, but the three-door feels barely any bigger inside. At least the front chairs tilt and slide forward to aid access, and up front there is plenty of space, with impressive headroom and improved shoulder room. And it’s a five-seat car in name only, really – the middle seat has a three-point belt, but it’s absolutely tiny. And while the small rear doors open nice and wide to make getting in easier, the door opening is narrow at the bottom so you’ll have to angle your feet to get them in and tuck them under the seat in front. There are two glove boxes (albeit the upper one is very small indeed), while nets on the seat backs and front passenger foot well give useful additional storage. 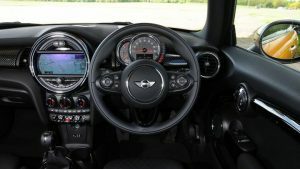 The MINI still comes with a central armrest that can hide a mobile phone, but never fails to be in the way of your elbow, whether you have it up or down, and also obscures the iDrive controller between the seats. Overall comfort, as discussed earlier, is not the best in the MINI – the seats themselves are on the small side, and combines with the MINI’s harsh ride quality at lower speeds, it can feel harsh. It’s like a go-kart in that respect too, which isn’t necessarily a good thing. Visibility is pretty good though, despite the MINI’s letterbox windscreen. This is largely thanks to the thin pillars, for a modern car anyway, but they’re getting fatter with every MINI iteration. The MINI’s apparent growth isn’t just a trick of design – in every direction the third generation car is bigger than its predecessor, which in turn was bigger than the 2001 model, which in turn dwarfed the 1959 original. In modern context, at 3.8m long, the three-door MINI is significantly longer and wider than a Volkswagen Up. The five-door even more so, naturally, measuring in at almost 2ft longer than the Volkswagen. That takes it out of the city car leagues of the original and firmly into modern supermini (Ford Fiesta etc.) territory. Up front it’s a much more comfortable tale in the MINI than in the back, regardless of how many doors there are. For a car small by definition, the space up front seems remarkable – a 7ft person would have adequate head- and legroom, largely on account of how low the seats are set – a benefit of the ‘go kart’ brief. The three-door offers a very cramped rear section, but the five-door is another story – what a difference a few millimeters makes. There’s noticeably more rear legroom – and it makes all the difference when taller people are up front. It basically makes the rear seats useable in a circumstance where they simply wouldn’t be in the three-door MINI. The boot space is better than ever, up 30 per cent over the last MINI’s to 211 litres. And the five-door’s is better still, with its 278-litre space measuring up well against rivals like the Ford Fiesta (290 litres). A twin-floor boot is standard, which is useful in raising the loading level to the lip of the rear hatch, making loading and unloading easier. It nearly clips up onto the back of the rear seats when not in use, too. The newest MINI scored four stars in a 2014 round of Euro NCAP crash tests, which is mildly disappointing when most new cars these days achieve five. A 79% score for adult occupants and 73% for child occupants are perhaps what you’d expect of a small car – but way behind the 84%/85% ratings respectively for the BMW 2 Series Active Tourer that’s based on the same chassis (and was tested at the same time). The MINI’s worst Euro NCAP score was 56% for safety assistance systems, largely because newer technology like lane departure warning isn’t available at all, while low speed autonomous braking (city braking assistant) is optional, as is a head-up display and automatic cruise control. The MINI does have two Isofix points as standard, however. For impact protection it features high-strength steel in the body, impact absorbers and a pop-up bonnet to help improve a pedestrian’s chance of survival if struck. Electronic stability control (which can be switched off), anti-lock brakes and tyre pressure monitoring are all standard. Owners tell us MINI has its work cut out in the satisfaction stakes, with the previous hatch finishing a lowly 141st in our Driver Power 2013 survey. However, the new car features plenty of BMW input, which bodes well for reliability, while fit and finish is second to none. The MINI comes with a three-year/60,000-mile warranty, covering the usual gamut of mechanical and electrical parts – not including those subject to normal wear and tear. Beyond that, MINI offers a very similar service to BMW (unsurprisingly), called MINI Insured Warranty, available to any car under 100,000 miles. It can be purchased as either an extension to the standard warranty, or for specific components, like the clutch, engine or gearbox. For a further three years thereafter, or 30,000 miles, the MINI TLC XL package is £275, basically covering the same thing. Both these payments can be bundled in with the cost of the car or bought separately, and are useful in keeping running costs down overall.